Whiteout conditions across the north and north-east caused havoc yesterday as winter continues to bite. 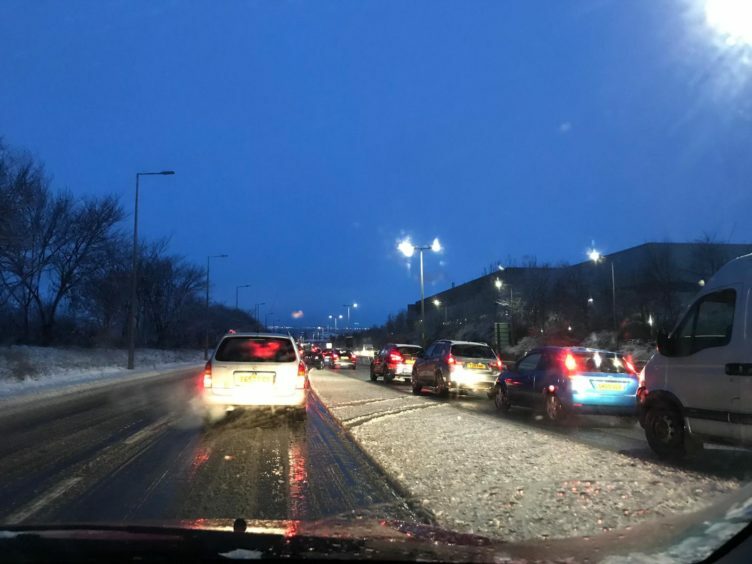 And a jack-knifed lorry blocked the A9 southbound between the Inshes and Milton of Leys junctions, causing traffic to be backed up to the Kessock Bridge. Traffic on the A9 yesterday morning. A police spokesman said some lorries got stuck on a hill on the A9 south of Inverness yesterday morning, bringing the rush hour traffic to a standstill. Later the snow cleared and traffic started moving again. The Met Office, which had a weather warning for snow in place, said 3.15ins fell at Altnaharra, while 2.3ins fell at Aviemore and Tulloch Bridge. More than 60 schools and nurseries across the region were forced to close, primarily in the areas which experienced the heaviest snowfall, with the wintry conditions halting travel plans as buses were unable to transport children safely. Meanwhile a heating system failure forced Alves Primary School pupils to stay home. Last night, forecasters said the worst of the weather for the north and north-east has now passed . But they also warned there may still be some isolated snow fall later in the week. Becky Mitchell, a meteorologist with the Met Office, said: “The snow that we had on Sunday night into Monday has now moved away but it will still be pretty cold with temperatures going down as low as -9C in some parts of the north-east. A number of ferry sailings are either cancelled or disrupted today and Wednesday as a result of the high winds and swells. CalMac said the Oban to Castlebay boat is cancelled today, with a strong possibility of further disruption or cancellations tomorrow. Today’s sailings to Coll and Tiree are cancelled and with 40mph gusts predicted, the ferry between Mull and Iona was also warning of predicted disruption. Sailings between Mallaig and the Small Isles are also disrupted.